We found this sitting on a shelf. The loose filament says it is burned out. I know everything’s bigger in Texas but really…. I know it’s not terribly old…but I’ve never seen one and I’ve been an electrician a long time. Anybody know what it fits? 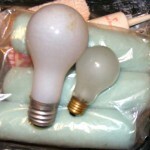 It is shown here next to a typical 60 watt bulb for reference. I’ve been an electrician a long time and have never seen one. There is nothing in the house that it fits (that we’ve found so far). Note…I’ve had several helpful readers email me and let me know…this base is called a “Mogul” base…and now that I know the term they are easily searchable. 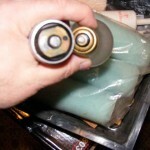 This size is still available…typically in 250 watts or so…widely used in floor lamps in the past…probably what this one was for. They are still used for some HID bulbs now, as well as for some landscaping lights. Adapters and even CFL replacements are available for them if you have something like this. This entry was posted in Electrical, Wierd and Wonderful. Bookmark the permalink. That’s a Mogul bulb. I’ve never seen one in a ceiling fixture, but they were common in floor lamps at one time. I still have one, vintage 1920. 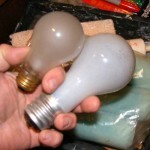 You can buy the bulbs from specialty dealers, but they’re expensive and short-lived. If you have a lamp with a Mogul socket, buy an adaptor.